Our very own Cynthia Coleman has just earned her CCMP™ credential through the Association of Change Management Professionals. Over the years at Heller Consulting, we’ve learned that the logistics of strategy and technology projects can be managed through project management, but true success ultimately depends on how the individuals involved participate and adapt to new ways of carrying out their work. Change management is the key to ensuring that our clients fully realize the benefits of their investments in technology. Cynthia has been a true leader in bringing best practices around change management to our work and we’re thrilled to share her insights on what it takes to become a Certified Change Management Practitioner™. What are the eligibility requirements for a CCMP™? Completion of 21 hours of instructor-led change management training. How did you meet the requirements? I’ve been a Project Manager at Heller for four years and a Consultant for five years before that, focused on projects that help nonprofits modify or implement CRM systems to better manage their work. I’ve also been managing people for the past five years. Heller’s project methodology is very customized to meet each client’s specific needs. As a project manager, I’ve worked with stakeholders to understand how they are impacted by the change their project is intended to bring about and to develop strategies that help them adapt to new ways of doing things in the most productive way possible. The ultimate goal of each project is to successfully move our clients from their current state to a future state that sets them up to more effectively achieve their mission and have a positive impact on the world. How is Change Management defined? I’m pretty by-the-book, so I like the definition in Associate of Change Management Professionals (ACMP) Standard for Change Management: Change management is the practice of applying a structured approach to transition an organization from a current state to a future state to achieve expected benefits. What I like about this definition specifically is “the practice of applying a structured approach.” I love the idea that if you take certain steps, or follow a specific process, you’re more likely to achieve success. Are there ways that you think the concept is misused or misrepresented in the nonprofit sector? The misconception I see the most is that Change Management isn’t needed because everyone is onboard with the change. Nonprofits tend to be very focused on the positive aspect of delivering on their mission – and that’s wonderful and necessary. The idea of innovating or implementing new tools that will help them do that can be very exciting. But I don’t think it’s widely understood that, even when things are intended for the better, resistance to change is the normal response. Applying change management methodologies allows organizations to acknowledge and proactively address that resistance, in order to make sure they reach their goals. It’s focused on the people side of change. When used properly, you get all those feelings people might have about a change, whether they’re positive or negative, out on the table and address them. This allows the orgs to better manage those individuals who have negative feelings about a change and leverage those who have positive feelings about it so the org is more likely to experience a successful change. What inspires you about the concept and practice of change management? I guess I don’t like surprises that much and it seems like change management makes sure people don’t feel blindsided or steamrolled. Instead, change management acknowledges that each individual and organization experiences change differently. Knowing this allows you to customize your change management approach on a project. Wouldn’t it be great if before every change someone talked to you about it, acknowledged the impact it was going to have on you, made sure you understood why it was happening and why your role mattered? Helping people feel understood and making it clear that their involvement in the change is important empowers them to participate. And when everyone participates (to the appropriate extent, of course), organizations achieve better results. That’s what change management can do. Can you think of a project from the past that could have benefited from change management? 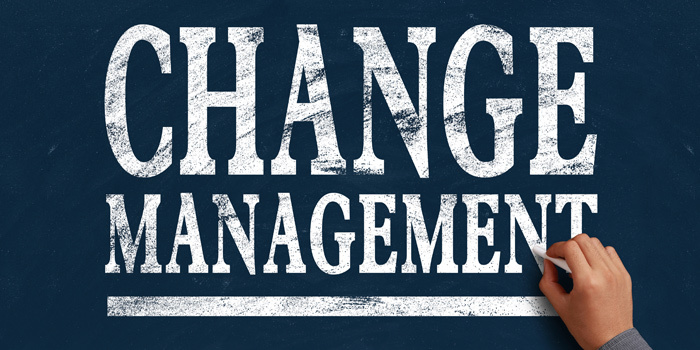 I can think of many projects that would have benefited from change management. On all of them, the circumstances were almost the same. Sponsors, project leaders, and in some cases, the Heller team assumed everyone was on board with the change. Everyone thought staff members could handle their regular workload in addition to the project work and under estimated the impact the change would have on performance once the new system was launched. What happened on each project differed a bit, but there were some general themes. End users struggled to meet deadlines and just get their jobs done because there was a learning curve. In some situations, they reverted to old ways or cut corners on business processes because they needed to just get it done or felt they had tried to express concern and no one listened to them during the project. That led to low morale across the board and the org had to invest more money in support from us or other vendors to address issues that hadn’t been adequately surfaced earlier. In the most extreme cases, many employees quit after the project was complete. So much of this could have been avoided with proper change impact assessments, stakeholder assessments and engagement plans, resistance management, and sustainability plans – that whole “structured approach” thing. Does Heller Consulting apply these concepts when it undergoes change? At Heller, we place high value on cultivating resilience and self-awareness in our team members. As a firm, I think we’ve always had a core belief that nonprofit work is for and about people (and animals!) and that the most effective way to make an impact is by helping people reach their potential. Our leadership and managers do a very good job planning for how we’ll manage messaging and roll out a change within the firm. We talk about how different individuals will be impacted, then develop strategies for their managers to use when guiding each individual through the process. That said, learning the formal techniques of change management has really helped me take my work to the next level both as a project manager with my clients and as a manager on my team. Are there any books or other resources about change management that you would recommend? Familiarizing yourself with ACMP’s The Standard for Change Management® is my first recommendation. Leaders Eat Last by Simon Sinek is a good book that change leaders might find useful, and I think most books about resilience are great as well like Real Happiness at Work by Sharon Salzberg or anything by Brené Brown!